Our Fall 2016 meeting schedule is available now! We’ll be hosting socials and formal meetings throughout the semester. Download the poster here. Laura Mandell (Professor of English and Director of the Initiative for Digital Humanities, Media, and Culture, Texas A&M University) will be joining us on April 15, 2016! Download a copy of the poster here. Digital Scholarship Librarian Thomas Padilla will be joining us on March 29, 2016! Download a copy of the poster here. Check out our Spring 2016 meeting and speaker schedule! Same time and place as last semester, unless otherwise noted. You can download a PDF copy here. 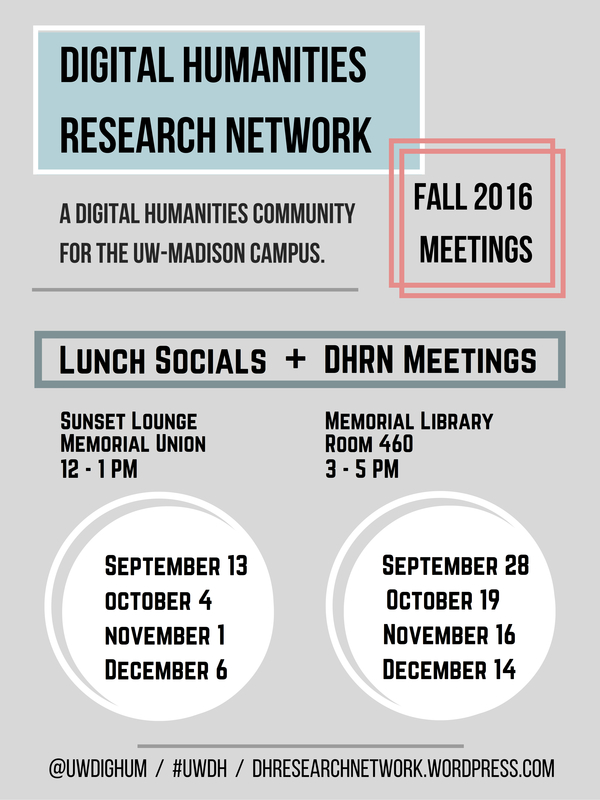 Our Fall 2015 meeting schedule is finalized! We’ll be gathering every other Tuesday from 4:00 to 6:00 p.m. beginning September 8. You can download the poster here. The poster for our spring symposium is out! You can download a PDF version here.